A long-time Wall Street market watcher is offering investors encouragement. According to LPL Financial’s Ryan Detrick, the stock market’s wild swings will likely fade following Tuesday’s midterm elections. His case stems from history. He went back to World War II, found all of the October closes in midterm years and tracked what happened until the end of the year. The results came in bullish. Over the past month, the S&P 500 is down more than 6 percent, During that period, its lowest closing came Monday, 2,641, and has gained almost 4 percent since then. Detrick pointed out the recent downturn isn’t unusual. 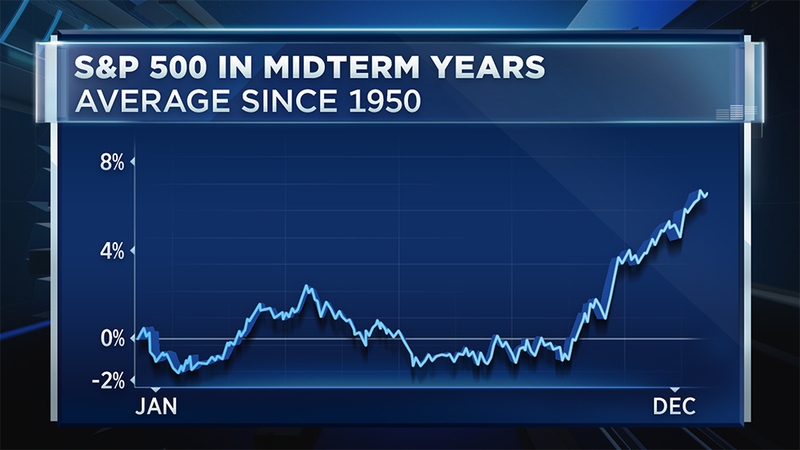 During a midterm year, his data show the S&P 500 has actually been negative year to date in early October. “Look at the last couple of elections we’ve had; 2014 midterms: We had a big sell-off into the middle of October, then a bottom, then a rally,” he noted, adding that nearly all of the year’s gains happen in the final months of the year. Once Tuesday’s midterms get out of the way, he said, seasonals will dominate the market. That’s when a “surprise” year-end rally could take over, according to Detrick. “That October 29 low, especially with the strength we’ve seen in the last couple of days, really could be a pretty major low,” Detrick said. — CNBC’s Keris Lahiff contributed to this article.